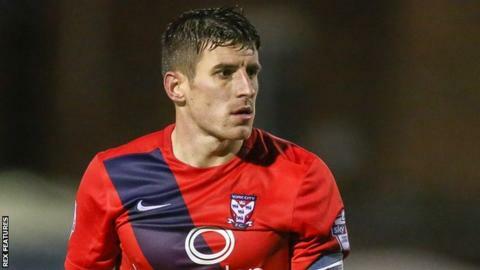 York City secured successive home wins for the first time this season with a 2-1 victory over Notts County. Jon Stead struck the bar early on for County, before Michael Coulson lobbed Roy Carroll from 15 yards to open the scoring for York. The Minstermen doubled their lead when Russell Penn's backheel allowed Kenny McEvoy to cross to Bradley Fewster, who converted from close range. Lubo Satka's own goal, an attempted back pass, handed Notts a consolation. "I'm delighted with the win. We had to withstand a number of corners but I thought we dealt with it. That was my main concern before the game - the superior height advantage. "We scored a fantastic goal with Coulson and grew in confidence after that. "The second half was a bit scrappy and nervy but I'm delighted. It's a massive three points." Match ends, York City 2, Notts County 1. Second Half ends, York City 2, Notts County 1. Attempt missed. Daniel Galbraith (York City) left footed shot from the left side of the box is high and wide to the left. Gary Mackenzie (Notts County) wins a free kick in the attacking half. Attempt missed. Jason Banton (Notts County) right footed shot from the left side of the box is high and wide to the right. Curtis Thompson (Notts County) wins a free kick on the left wing. Corner, Notts County. Conceded by Michael Coulson. Substitution, Notts County. Adam Campbell replaces Izale McLeod. Substitution, York City. Reece Thompson replaces Bradley Fewster. Corner, Notts County. Conceded by Russell Penn. Attempt missed. Jake Hyde (York City) right footed shot from outside the box is close, but misses to the right. Foul by Gary Mackenzie (Notts County). Jake Hyde (York City) wins a free kick in the attacking half. Substitution, York City. Jake Hyde replaces Kenneth McEvoy. Attempt missed. Daniel Galbraith (York City) right footed shot from outside the box is too high from a direct free kick. Haydn Hollis (Notts County) is shown the yellow card for a bad foul. Daniel Galbraith (York City) wins a free kick in the attacking half. Corner, Notts County. Conceded by Dave Winfield. Substitution, York City. Matt Dixon replaces Luke Summerfield. Jason Banton (Notts County) wins a free kick in the defensive half. Foul by Lubomir Satka (York City).